Juan Carlos Rodriguez is a Venezuelan born pianist & composer who graduated from the prestigious Berklee College of Music with a degree in film Scoring Composition. He started his music career in USA working with multi-platinum artist Shakira and double Grammy Award winner Bacilos as Engineer and keyboard player & arranger respectively. 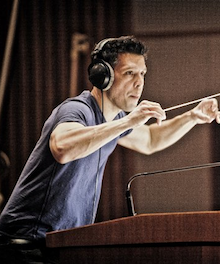 A television composer since 1999, more than 1000 episodes of music composed and a two time recipient of the BMI Film & TV Award in 2010 and 2013, Juan is a versatile composer whose works include: NBC’s Telemundo, NBA, MLS, NBC6 News and Telemundo News main themes, He successfully composed original music for the web series East Los High and he is starting to compose now for the second season airing in summer 2014. He was main composer for the hit bi-lingual television series, RPM Miami for NBC’s Mun2 back in 2010. He has also composed underscore for SyFy’s Paranormal Investigators, National Geographic’s Megacities, and Animal Planet’s I Predator. Juan Carlos also wrote the main titles for the shows Nitido, Sports Rhythm, Al Rojo Vivo and the main title and underscore for 10 dramatic TV series each with 130 episodes such as But the Devil Knows, La Patrona, and Prisoner among others. For his first score in the short film Reflected, Juan was awarded the Best Score for Short at the 38th Houston International Film Festival in 2005. Since then he has scored the films Trivial Things, Tell Me Something, and The First Blow? for Universal Studios Home Entertainment. He is currently finishing short film Manipura here in LA.